Hundreds of people were asked by 1001BestWays.com to reveal their best ways to handle major life challenges like raising kids, maintaining a relationship, having fun, cleaning, and accepting mortality. This is a collection of 1,001 of their responses, broken down by category. It's simultaneously funny, touching, surprising, insightful, and inspiring. Some you will agree with completely. Some you will dismiss as obvious or ridiculous. Others will amaze you with the depth of their knowledge. This book is perfect for those looking for advice on many different subjects. The input of many different people from different backgrounds and schools of thought make for an interesting and fun read. The Amazon synopsis sums everything up perfectly. Some of the entries are amusing while others are more serious. Some of the hints/tricks will apply to one's life right away. There will be a few that will stick with the reader even after he/she has finished the book. Different portions of the book will apply to different people. Women may favor the relationship/family section while men might prefer the money section. The author did a good job of putting the correct advice into the correct portion-there were no mistakes. The book itself is a quick read, good for a rainy day or car ride. This book is recommended to adult readers. 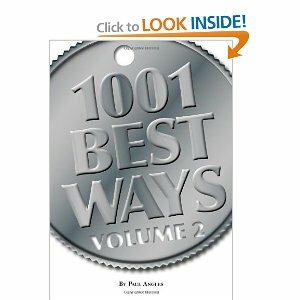 The second book in the acclaimed "1001 Best Ways Series", the only self-help series written by its readers. 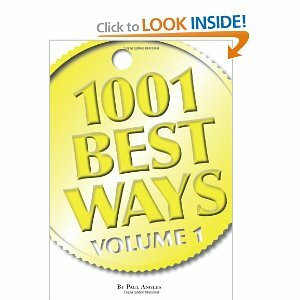 Hundreds of readers of 1001BestWays.com come were asked, "What's your best way to...". And they responded with unusual, insightful, inspiring, and informative answers to the most common issues of life in the 21st Century, like raising children, saving money, maintaining a relationship and more. 1,001 of their best answers, the distilled wisdom of a huge crowd, were collected into Volume 2, the sequel to the highly-regarded original. This next volume is a continuation from volume 1. The Amazon synopsis sums this book up perfectly as well. The book offers up more perspectives from a vast group of people on different subjects once again. The reader should be able to find most of the information informative and interesting. The book is easy to finish and hard to put down once a reader starts to seriously read. There is plenty of good advice-some are worth another look and perhaps writing them down. The idea of compiling advice from so many different sources is an excellent one.